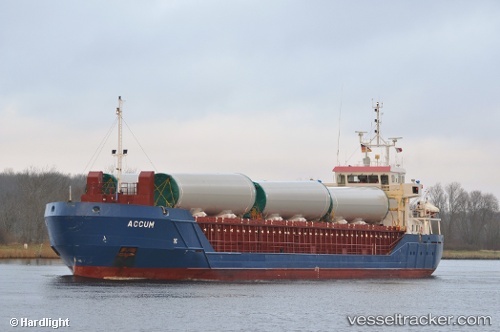 The "Accum" with a pilot onboard ran aground while leaving the Big Port of St. Petersburg on Apr 28, 2015, after a spell at the Severnaya Verf Shipyard since Apr 26. The accident occurred due to a power failure, and the ship which was bound for Brussels hit the edge of an enclosed part of the access/exit sea channel near Zolotiye Vorota. The tugs "Griphon-3" and "Griphon-7" of the St. Petersburg based towing fleet operator Griphon Ltd. refloated the vessel and towed her to Pier No 63 for hull inspection at the Petrolesport Container Terminal at 10.20 a.m. The multipurpose salvage/oil boom workboat "Alphard" of Rosmorrechflot's Maritime Salvage Service also responded. On Nov 6, 2013, officials of the Water Police Brake inspected the "Accum" which had entered the port with a signicant list to starboard. They found the freeboard line completely under water. The ship was overloaded by about 40 tons. According to the documents it had on board 2666 tons of flax seed. For the voyage from Liepaja to Brake no stability calculation could be submitted. After consultation with the safety department of the BG traffic the captain had to pay a security deposit of around 630 Euro for the freeboard violation and for the non-existent stability a security deposit of 531 Euro. In addition, a Port State Control was carried out on Nov 7 before the ship was allowed to continue its way to Hamburg with an ETA of Nov 8. The agent for the "Accum", the Harvest Agency Services in Essexsaid, stated that fire damage has been limited in Ipswich and the ship was about to set sail again soon. Wooden crates on the lower deck of the "Accum" were alight, but the ship's carbon dioxide extinguishing system helped put the fire out. The ship was expected to leave Ipswich by Dec 13 bound for Cyprus. The 100 vehicles on the upper decks only had suffered smoke damage. The wooden crates containing machinery on the deck below have had some soot damage. Seven fire crews had spent about three hours dealing with the incident in the afternoon of Dec 10. Since then the ship was waiting for its extinguishing system to be replenished before it would be allowed to leave. The ship will take 16 days to get to Cyprus, and damage to the crates could not be assessed until the vehicles, which are a mix of used cars, lorries and tractors, have been unloaded.